← Mouse invades bento, yet again. I needed to get an early start with my day because of some chores I had to finish. I finished earlier than expected so I figured I’d go for brunch at the mall. Unfortunately, or maybe fortunately, it was still closed so instead, I went to Max’s for breakfast. 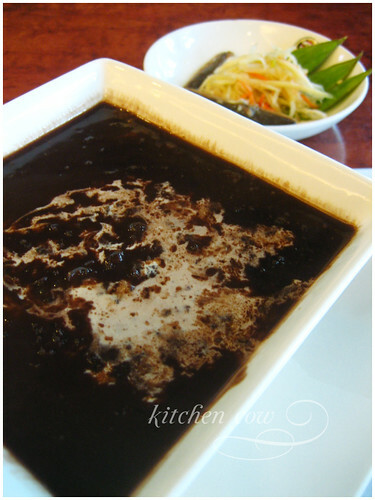 I love champorado and tuyo. While it wasn’t on the menu, a quick inquiry about their champorado (chocolate porridge) and tuyo (dried herring) had my server offering a different menu, featuring their breakfast specials. BINGO! Your classic champorado, Max’s feels practically homemade. It had that traditional tsokolate taste, made creamy only by the addition of milk. It was lightly sweetened, letting you enjoy the darkness of the chocolate. Paired with a serving of gourmet tuyo, I was in breakfast bliss. Even the weather cooperated. What better seasoning can you add to a bowl of warm porridge but cold, drizzly weather? 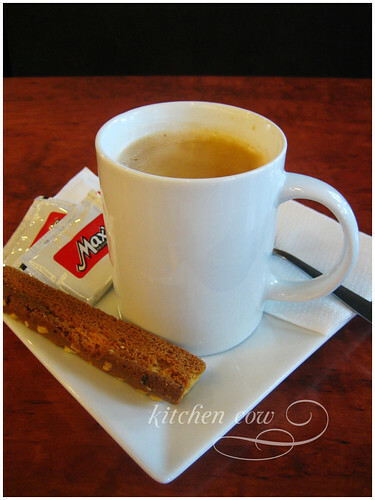 Along with my champorado and tuyo, I had a steaming mug of brewed coffee, served with biscotti on the side. The only thing which could’ve made my morning better was if I were still in bed while I was enjoying all that but I guess that’s pushing it. Each morning should be like this. Don’t you agree? This entry was posted in restos & eateries and tagged breakfast, champorado, dried herring, filipino food, max, max's, restaurant, tuyo. Bookmark the permalink.